Indian cricket captain Mahendra Singh Dhoni is likely to make a special appearance in actor-director-producer Prakashraj's next directorial venture Dhoni. The film, being made in Tamil and Telugu, stars Tollywood director Puri Jagannath's son Akash and Bollywood actress Mugdha Godse. Recently, Prakashraj unveiled the first look of Dhoni on Twitter. Apart from direction, Prakashraj is also producing the film under the banner of Duet Movies. Music Maestro Ilaiyaraaja will compose the tunes. 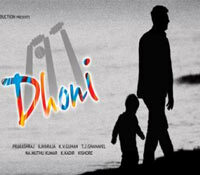 Dhoni is based on a child’s aspiration to become like famous cricketer Mahendra Singh Dhoni. It is the second directorial venture by Prakashraj, who debuted as director with Naanu Nanna Kanasu (Kannada), remake of the Tamil super hit Abhiyum Naanum.